Today, RoboValley launched the beta version of its robotics platform: connect.robovalley.com. You are invited to join us and help create an active community of robot users, creators, experts and policy makers in the field of robotics. At RoboValley, we help companies to articulate their demand for robotics. We bring in experts from universities and companies to create solutions. We match companies to propose business cases and business planning, which has already led to a number of interesting business opportunities. With connect.robovalley.com, we host online co-creation sessions to support these activities. Through connect.robovalley.com, you can present your company, offer your services and address various topics and ask questions directly to the community. In the beta version, you can send your questions directly to us, in a later stage we will have more advanced matchmaking tools to match supply and demand in a more efficient way. 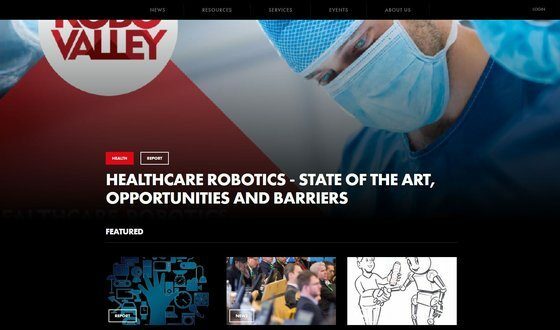 On connect.robovalley.com, you can find information on robotics companies, people working in the field of robotics and robots. You can browse through the recent RoboBusiness Europe presentations and read intelligence reports concerning three main robotics areas: agriculture, health and the Internet of Things. Stay up to speed with the global robotics developments in the news section. Read our blog posts on various topics, such as responsible robotics, and share your thoughts. Most companies that are active in the field of robotics are looking for skilled people. You can advertise your vacancies directly on connect.robovalley.com and, during the coming months, we will build a more advanced job board. In the coming months, we will expand our activities by adding more and more content to the platform. Our partners will offer their (financial and legal) insights and services. We are writing use cases for different industries to show what it means to robotise. Next to that, we will offer a wide variety of video examples of robots. We work together with intelligence experts to map the global robotics community. With their help, we will be able to answer your questions regarding the market.